Despite historical animosity, Iran and the United State would have made natural allies in Afghanistan. After 9/11, Supreme Leader Ali Khamenei condemned the attacks and, in a stark contrast to the scenes of jubilation observed in some Middle Eastern cities, Tehran publicly mourned the attacks. In 1998, the Taliban killed 11 Iranian diplomats in Mazar-i-Sharif and on the eve of 9/11 Iran was already conducting a proxy war against the Taliban through material support of the Northern Alliance. Iran shares many cultural and linguistic similarities with various ethnic groups in Afghanistan and unlike Pakistan, it is not home to a large Pashtun population that at times has sympathized with the Taliban. Furthermore, unlike Pakistan, Iran had every reason to want a stable and successful Taliban-free Afghanistan. Instead of embracing a strategic alliance with Iran, however, the Bush administration chose Islamabad as its liaison into Afghanistan and shunned Tehran as part of the infamous “axis of evil.” Such rhetoric is not one-sided, as Khamenei has periodically accused the United States of fomenting insurgency in its border city of Zahedan and elsewhere. Iran has also been accused of supporting al-Qaeda and the Taliban in operations targeting U.S. troops. But this appears to be reactionary and it is unclear how Khamenei would have responded to a genuine request for help in Afghanistan, whether open or clandestine. Furthermore, it is largely accepted that the main intelligence agency of Pakistan — Inter-Services Intelligence, or ISI — has also assisted the Taliban to placate extremists at home. President-elect Trump has an opportunity to undo past mistakes in Afghanistan and steer the country toward self-sustainability. But this will prove impossible if the southwest region remains an ungovernable frontier. Bringing stability to the region can only be achieved by introducing at minimum a limited partnership with Tehran to curtail the drug trade. A reduction in drug exports is in Iran’s interest, as it faces a heroin epidemic and rising HIV rates. Beyond military coordination, the United States must acknowledge that land-locked Afghanistan cannot achieve economic independence without a strong trade relationship with its neighbors. 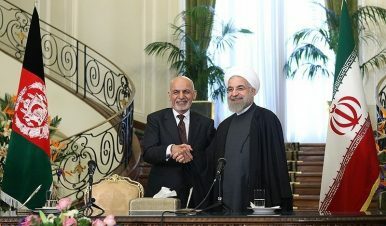 Since taking office in 2014, Afghan President Ashraf Ghani has traveled to Tehran twice to seek increased bilateral trade. Afghanistan intends to use Iran’s newly opened Chabahar port to conduct its own exports. No hesitation from the new U.S. administration will prevent increased economic ties between Iran and Afghanistan, so it is only prudent to take advantage of potential military cooperation as well. Trump must choose between Iran or the Taliban in Afghanistan. Any approach that excludes Iran will only strengthen the Taliban, weaken the elected government in Kabul, and prolong the war. Adam Weinstein is a U.S. Marine veteran of the war in Afghanistan, where he served in support of Australia’s Special Operations Task Group. He conducts research for the Think Tanks and Civil Societies Program at the Lauder Institute, University of Pennsylvania.